Buy 2 for only 19.99 each with Free Shipping!! Free shipping on APS Nutrition NMDA 100! NMDA 100- The Most Potent NMDA Testosterone Product on the Market! N-Methyl-D-Aspartic Acid (NMDA) manufacturerd by APS is an amino acid derivative capable of causing an intensely anabolic response from NMDA receptors found within our bodies. NMDA receptors are designed to accept only certain compounds to connect to them, the most potent being NMDA. When NMDA binds to an NMDA receptor our HPTA (hypothalamic-pituitary-gonadal axis) is sent into overdrive and released a potent combination of testosterone, growth hormone, IGF-1, and IGF-2. Background: Aspartic acid is one of the 20 common amino acids that are used by the body to construct proteins and is considered to be non-essential since it can be made from oxaloactetate, an intermediate of the tricarboxylic acid cycle. There are two isomers of aspartic acid, the L-isomer and the D-isomer. Only the L-isomer is used in proteins while the d-isomer is used as a neurotransmitter as d-aspartic acid and N-methyl-D-aspartic acid. D-aspartic acid is known to stimulate the NMDA receptor. More recently, D-aspartic acid has been shown to have some intriguing effects in several animal species and humans. D-aspartic acid has been shown to enhance gonadotropin, releasing hormone from the hypothalamus as well as growth hormone (GH) and luteinizing hormone (LH) release from the pituitary. Sodium D-aspartic acid has also been shown to directly increase testosterone production by the testes , DAA does this by increasing the levels of steroidogenic acute regulatory (StAR) protein. StAR plays a critical role in the production of steroid hormones in the testes and adrenals. In fact, StAR mediates the rate-limiting step in steroid hormone production, the importation of cholesterol into the mitochondria. All steroid hormones are manufactured from cholesterol in the mitochondria and if cholesterol doesn?t get into the mitochondria, then steroid hormones, and more specifically, testosterone does not get produced. DAA increases StAR which increases cholesterol entry into the mitochondria which results iin increased testosterone production. APS was the first company to introduce D-Aspartic/NMDA technology to the market back in 2008. In fact, our groundbreaking discoveries with the product NMDA launched an entirely new category in the sports nutrition market! In fact, we found the Italian patent that invalidated Ron Kramer’s bogus patent on DAA. However, NMDA?s formula is still light years ahead of our competition and we guarantee that NMDA 100 is the absolute most powerful and effective natural, non-steroidal testosterone increaser. APS NMDA 100 utilizes an exclusive, proprietary and novel delivery system that combines complimentary properties of liposomes and polymeric nanoparticles i.e. nanolipobeads represent a new trend in the application of site specific target compound delivery. 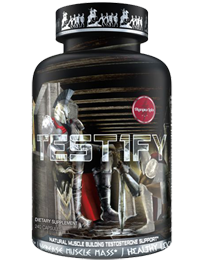 The problem with hormone most products on the market is that are not bioavailable and do not allow you to see the amazing benefits of testosterone. APS unique preparation of nanolipobeads involves three important steps- (a) Preparation of PVA hydrogel nanopartices by emulsification followed by freeze thaw cyclization method (b) Surface acylation of PVA nanoparticles by treatment with polmityl chloride and (c) Preparation of nanolipobeads by formation of PE liposome on acylated PVA hydrogel nanoparticles by vesicles fusion.The Preparation of PVA hydrogel nanopartices was then optimized by various formulation and process variables variables e.g. polymer concentrations, drug concentration, emulsifier concentrations, and a number of freeze thaw cycles, stirring speed, stirring time, and sonication time to obtain nanosized PVA hydrogel nanoparticles with maximum entrapment efficiency. This scientifically-engineered delivery system allows APSNMDA 100 to be delivered into the blood stream more rapidly, where they can be better absorbed and utilized without degradation in the liver as is experienced with other products. APS holds the worldwide rights to this unique product and advanced technology protein/peptide delivery system to this incredible Testosterone and [GnRH] Gonadotropin-Releasing Hormone Trigger. Pharmaceutical-Grade N-Methyl-D-Aspartic Acid 99.9% Pure* Percent Daily Values are based on 2,000 calorie diet.? Daily Value not established. 100 mg ? Other Ingredients: Microcrystalline Cellulose, Dextrose, Stearic Acid (vegetable source), Magnesium Stearate (vegetable source), Poly(Vinyl Alcohol) (PVA), Hydrolyzed Gelatin, Maleic acid, Silica. 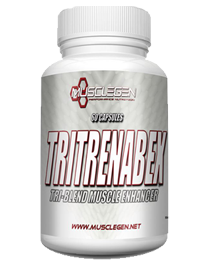 MuscleGen Research Tritrenabex 60ct, BOGO Available! !